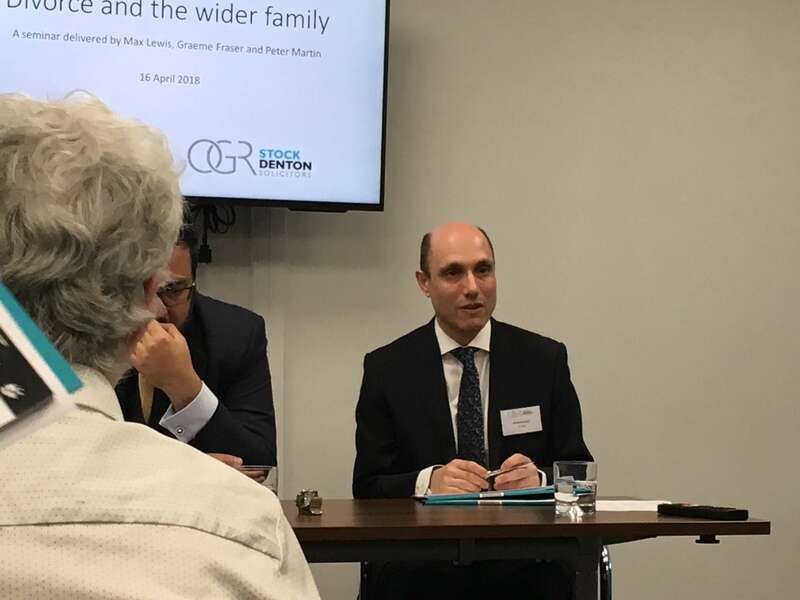 Lawyers from Finchley-based law firm OGR Stock Denton LLP offered clients and contacts the lowdown on how to preserve family wealth and assets on divorce. At a seminar on Monday 16th April essential information was provided as to how inheritances and other family wealth arising outside of a marriage can be preserved on divorce. Max Lewis, a Barrister at 29 Bedford Row Chambers with Peter Martin and Graeme Fraser, Partners in the Family Law Team at OGR Stock Denton LLP, offered practical guidance and insider tips on how to most efficiently strike the balance between long-term financial planning and the potential consequences of divorce. The speakers discussed the latest legal developments and, how litigation can be avoided by proper advance planning, strategies to adopt when negotiating these matters, and alternatives to traditional litigation. Graeme Fraser said: “Wealth and estate planning is an increasingly significant area of family law. Issues concerning wider family wealth commonly arise, and this seminar dealt with what can be done before, during and after a marriage. “One of the most important aspects of the discussion was around the importance of early planning. As house prices remain at such high levels, increasing numbers of young people need help to buy at precisely the moment that they are entering into what may be a first long-term cohabiting relationship and ultimately a marriage. “We also discussed the significance of prenuptial agreements and their benefits, relative to well thought-out trusts and other structures, as well as the importance for the family of aving appropriately framed wills in place. OGR Stock Denton LLP regularly holds seminars and events on matters of interest to clients, contacts and professional colleagues.